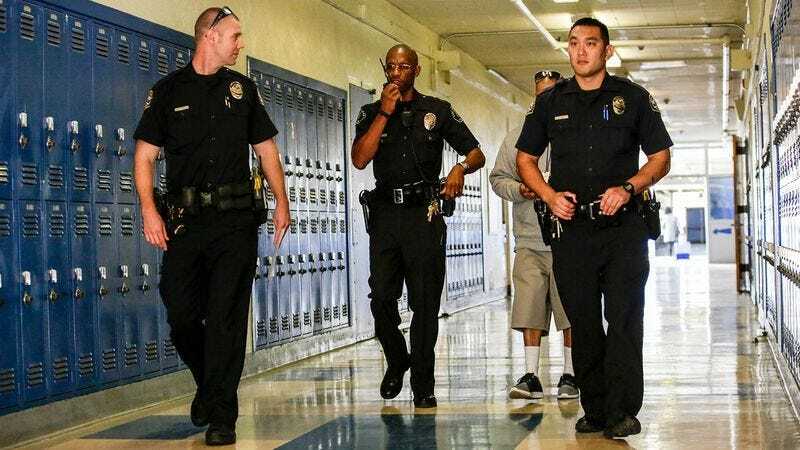 Everyone knows that there is a major gap in access to quality education in the U.S., but here is a disgusting level of inequality that’s going to make your blood boil: This high school has its own police officers. Seriously?? For those keeping track at home, this is what privilege looks like. When students arrive at Westville High School in the morning, there is a police officer stationed outside every entrance, plus two in the building who sit outside the cafeteria and main office. These fully trained officers aren’t cheap, but that doesn’t stop Westville from liberally peppering them around the halls, not to mention having them man two, count ’em, two, expensive metal detectors. We’ve heard of schools with pools and yoga studios, but this is beyond the pale. There are nearly as many police officers as teachers! And it doesn’t end at the final bell of the school day: When it comes to events like sports games and school dances, Westville is basically crawling with police. A 1:20 officer-to-student ratio is the norm at the Spring Fling—you can’t turn around without seeing an officer standing by, ready to keep students safe at a moment’s notice. When you look at all the schools that have to call the police and wait for them to arrive in the event of an incident, it’s pretty clear that Westville is the luckiest school in the country. Some just get a better shake based on where they’re born. This is the epitome of privilege. Enjoy it while you can, Westville students. Life isn’t always going to be a cakewalk.